What is a Statement of Owner’s Equity? A statement of owner’s equity takes information from the balance sheet and uses this information to track the rising equity a business owner has in his or her business for a designated financial period. The statement of owner’s equity can also sometimes appear as the statement of shareholders’ equity. If you remember the accounting equation, subtracting your liabilities from your assets will give you the amount of equity held in a business. For example, if your company has a sum total of $30,000 in assets and $25,000 in liabilities, the amount of equity held in the company will be $5,000. The statement of owner’s equity follows this amount, from the beginning balance to the current balance. What Goes on a Statement of Owner’s Equity? The information for a statement of owner’s equity comes from a couple of different places. The capital figure comes either from the previous period’s owner’s equity statement or it can come from the balance sheet from the previous month. The net income comes from the income statement. The income statement is the document that takes into account any revenue gained by a company and any expenses made by the company before any adjustments are made for taxes or investments. The income statement will give either a positive or a negative figure, depending upon whether the company made or spent more money. If the company makes more money than it spends, then the amount will go in the “net income” section of the owner’s equity statement. If the company spends more money than it makes, then the amount will go under “net losses” on the owner’s equity statement. Now that you know what goes on such a statement, it’s time to look at a sample owner’s equity statement. How do You Create a Sample Statement of Owner’s Equity? Take a look at the image to the left, of a sample statement of owner’s equity (the owner’s equity statement template is available in our media gallery). You will see at the top of the document, the company’s/business’s name will be listed, followed by the name of the document, Statement of Owner’s Equity. Next, list the period that will be covered, whether it is a month, quarter, half-year, or year. You will notice that the template in the media gallery also has a footer space for the date created and the name of the person creating the statement – if you wish, list these items as well. The actual statement lists the beginning balance for the period covered – in this case, it’s $50,000 – a healthy amount of owner equity. Under the opening balance for the period, you will see that there is a place to note any income from investments. You will see that there is a listing both for the net income and net losses – your statement will have either one or the other filled in – remember, this amount is the amount derived from your income statement. Any withdrawals need to be documented as well. 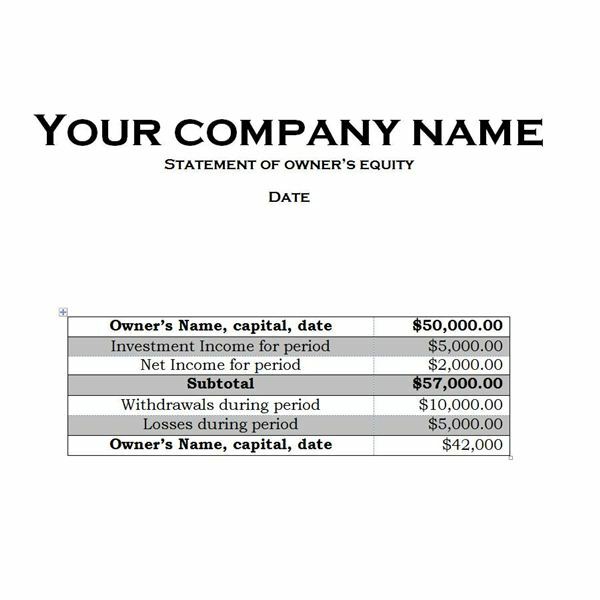 Finally, add the net income and investment income amounts to your owner equity capital balance and place this figure under “Subtotal” and subtract any losses and withdrawals and record the final amount under the new owner’s equity balance. By following these steps, it is easier than you think to create a statement of owner’s equity. Image Credit: Courtesy of screenshot provided by Ronda Levine of her media gallery template in Word format.